Activists returning to Taksim Square will be considered “supporters or members of a terror group,” Turkey’s EU minister told local media. 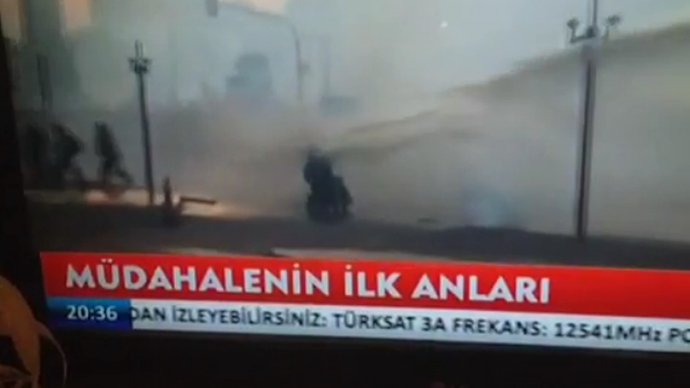 This comes after police bulldozed the tent camp in Gezi Park in one of the worst nights of violence in Istanbul. “From now on the state will unfortunately have to consider everyone who remains there a supporter or member of a terror organization,” EU Minister Egemen Gagis said in an interview with Turkish broadcaster AHaber on Saturday night. He requested that all the activists returned to their homes. “Our prime minister has already assured [activists] about their aim with the protests. The protests from now on will play into the hands of some separatist organizations that want to break the peace and prioritize vandalism and terrorism,” stressed Gagis. PM Tayyip Erdogan, who has been the target for many of the complaints of the protesters, appeared to take a more compromising approach to the demonstrators on Saturday. He agreed to postpone the reconstruction plans for Gezi Park (located beside Taksim Square) that initially riled activists. What followed was reported by many to have been one of the most violent nights since the unrest began two weeks ago. Riot police moved into the Square taking on half an hour to disperse the activists gathered there, using tear gas and carrying riot shields. Clashes then began to erupt at different spots around the city, with activists scuffling with officers. 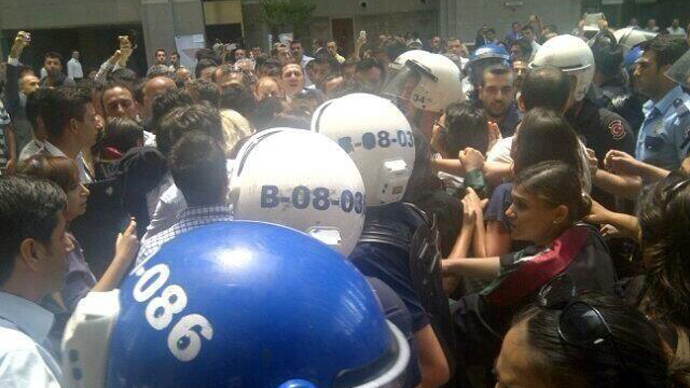 Witnesses claimed they were chased into hotels and accused the police of pelting them with tear gas even there. “They excessively use violence and tear gas against medical personnel and injured people, they target doctors who voluntarily support the health units healing the injured,” human rights activist Dr. Sebnem Korur Fincanci informed RT from Turkey. Some protesters ripped up paving slabs and used debris to create makeshift barricades to impede officers. Meanwhile in Taksim Square bulldozers cleared away all traces of the past two weeks of protest and police took control of the roads leading up to the square. 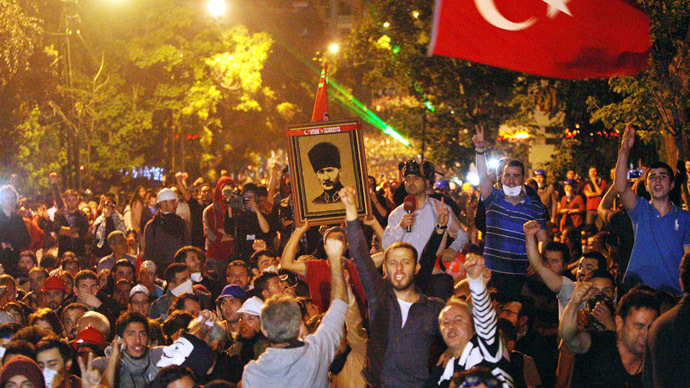 The governor of Istanbul confirmed that 22 people had been taken into custody in connection with the protests and stressed that anti-government gatherings are banned in Taksim Square and the surrounding area. 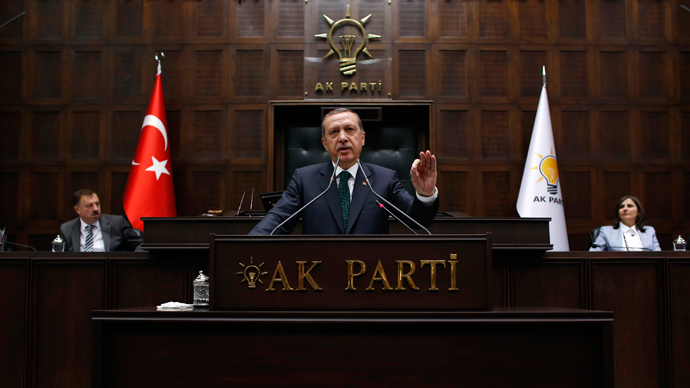 Protesters have targeted Erdogan with their demonstrations, alleging he has become increasingly authoritarian in his administration of Turkey. In addition, many complain that his party thrusts conservative Islamist values upon a secular state. 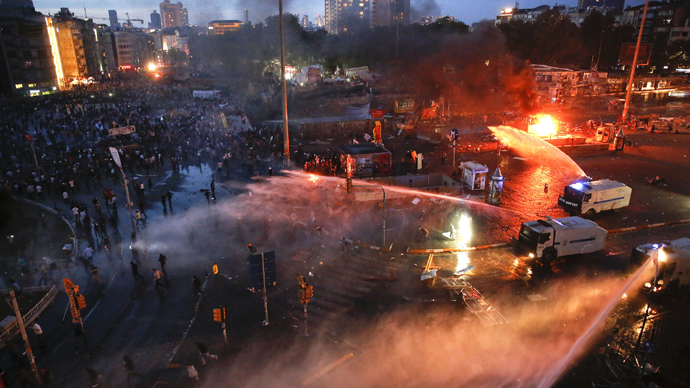 Separately in the Turkish capital of Ankara on Sunday police broke up a number of protesters near the Kizilay Square with water cannons and tear gas. Officers initially stopped a convoy of mourners as they prepared to lay Ethem Sarisuluk, allegedly shot dead by police in a protest, to rest. Austin Mackell, a journalist specializing in Middle Eastern affairs, characterized the unrest as an urban phenomenon made up of secular Western Turks who are used to having a strong voice in political matters. He stressed that the rise of a Muslim-orientated government had curtailed their say in government affairs and warned if the protesters did not unify the movement would quickly be extinguished. “There is a real danger that if the Gezi kids don’t get their act together that what they’re going to do will benefit the generals and the old-school secular authoritarians,” said Mackel to RT. 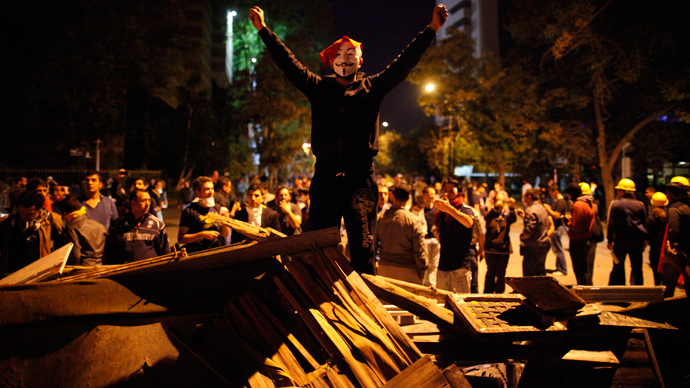 So far over 700 people have been injured in the upheaval in Turkey and at least five have been killed.